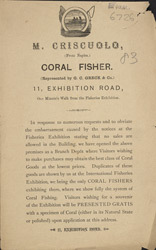 This is an advertisement for M. Criscuolo a coral fisher from Naples. Coral became very popular during the 19th century, small pieces were bought as ornaments for the home and some larger pieces were carved into intricate decorations. Coral was also used to make jewellery, the reds and pinks were the most popular colours however black coral was much sought after because it could be worn when in mourning.